Next iPhone to Feature 4.6″ Screen? The next iPhone will feature a significantly larger 4.6″ display, according to a report from Reuters. The brief report cites an unspecified source who claims that Apple has already placed orders for the larger screen with component suppliers. Display suppliers for the iPhone could be LG and Samsung, with Samsung currently producing 4.6″ displays for their own Galaxy SII Android phone, shown alongside an iPhone 4S above. If true, the next iPhone screen would be over an inch larger than the current iPhone display, which is measured at 3.5″ diagonally. A larger screen has long been anticipated for the next generation iPhone release, though most speculation focuses on a 4″ display, marking this as the first rumor of a 4.6″ display. Virtually nothing is known about the next iPhone, though it is expected to follow the release schedule set by the iPhone 4S, which debuted in early October of last year. It’s great to hear new rumours about the next iPhone, but I really do wish this is all it is – a rumour. Because 4.6″ is way too big. I want to put a new rumor out into the world, and I am going to be the first! The iPhone is going to have a 4.8 inch screen!…come on…anyone can make up a rumor like this. But the screen should be 4 or 4.2 inch large. Can see iPhone 5 being a different visual design to the iPhone 4 or 4s. Next phone will probably be an iPhone 4gs! It is absurd to make it bigger than it is, this is the practicality of an iPhone, the shape is perfect as well as the screen. If you want a bigger screen buy a computer or an iPad!!! I`d never buy so big crap. When I see people using that Galaxy paddle it looks more funny than useful. As Mark says, for bigger screen it is better to use another device. iPhone is just Phone and it offers enough, I think. Completely nuts… Apple’s own research showed that size does matter. Remember that was the whole purpose of the iPod mini and nano. Steve Jobs said people wanted smaller… Not bigger. If they can increase the screen size without increasing the form factor, I’m fine with that. Having had both the SG2S and the iP4 I can say that the larger screen is actually very nice, yes initially it seems like your holding a small television in your hand but that goes away quickly. Here’s something to consider. Width wise the SG2S’ screen isn’t any wider than the iPhone, in theory that 4.6″ screen could fit into the current iPhone4/s chassis with a much reduced top and bottom space for the camera/speaker/home button. The point here is that the iPhone(5) could have a 4.6″ screen in the same form factor as the current iPhone today. I for one hope that is exactly what happens, bring on the big screen! Indeed, rumors can start pretty easily. I do think a slightly bigger screen would be cool, but that one is probably too big. 4.6? Yeah too big. I love iPhone 4s desgin and it will make me sad if they do something too much to iPhone 5, but it will likely be very different. This coming from one who misses the white macbook. . .
bigger screens on smartphones are annoying, you can’t reach your thumb across the display on anything bigger than what is on the iPhone already. And I often use my phone one handed, as do many people. Bigger isn’t always better, and if one really needs a bigger screen, it really, really doesn’t need to be on a phone. 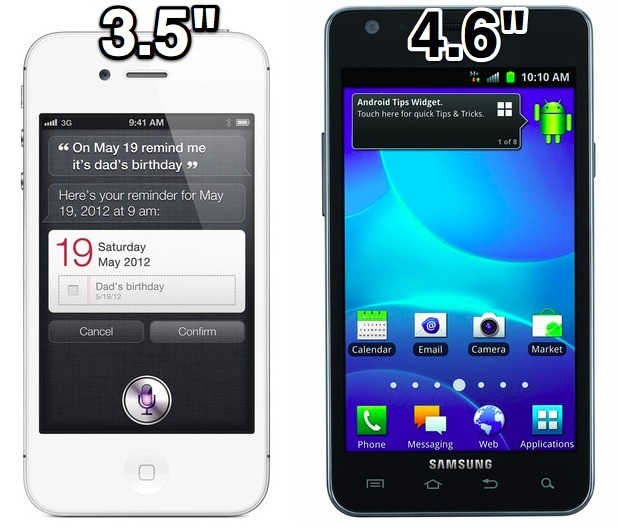 I just want to point out that the samsung phone in the picture has a screen of 4.3”, not 4.6”. The iPhone 5 should be called the iPhone 5″ and have a 5″ screen!!! Joking aside, I love my iPhone, but the battery life is killing me and I agree that the screen must be bigger, but how big?? ?